Mines are creepy, period. And, in reality, they're often dangerous places as well. Considering such a one-two punch of scariness and dread, it's surprising that very few horror films have utilized the setting as a viable backdrop for instilling terror. 1981's My Bloody Valentine employs the subject in an effective manner. Nearly a year later came The Boogens, an entertaining well-made monster thriller with slasher overtones - that has never quite achieved the status of the former. Two young men, Mark (Fred McCarren) and Roger (Jeff Harlan) are led by older veterans Dan (Med Flory) and Brian (John Crawford). Their initial work involves the checking of beams and setting off a controlled blast. Nearby, old man Greenwalt (Jon Lormer) watches intently. Mild-mannered Mark and wise-cracking Roger are about to rent a nearby house with Roger's girlfriend Jessica...whose best friend Trish is coming to help them settle in. That evening, Martha Chapman (Marcia Reider) - one of the owners - has gone there to get the heat going but is forced to stay overnight after her car gets stuck in a ditch. While reading a book and relaxing, she is dragged to the basement by a mysterious creature that has entered the home and who silences her screams. Deputy Blanchard (Scott Wilkinson) finds her car the next morning and puts a trace on it. Jessica (Anne-Marie Martin) and Trish (Rebecca Balding) arrive and make their way around the snow-covered sleepy town looking for the house, accompanied by Jessica's dog Tiger. Just after moving in, Trish is forced to go down to the basement to adjust the water heater so she can take a bath. The work continues at the mine. Mark and Roger (along with Dan and Brian) come upon the area that had been sealed off by the cave-in decades earlier and discover a cavern filled with skeletal remains...likely belonging to the men who were trapped by that catastrophic event. Roger's rendezvous with Jessica will be short because Brian is sending him down to Denver to pick up some updated maps late that evening. The two of them do manage to spend a little bit of intimate time together as Mark and Trish get to know each other. Deputy Blanchard stops by the cabin to inquire about Martha, having identified her car...but is told that the woman has not been seen. Roger, Mark and the girls then head out to dinner at a local cafe. At a bar next door, Roger picks up the key to Brian's pick-up and heads back to the house so he can get some shuteye before the drive to Denver. The others stay behind to play billiards and Brian tells Trish she should write a story about the Black Friday Mine Disaster, after learning she works for the Denver Post. Meanwhile...poor little Tiger is menaced by something not quite human and hides in a cabinet. Roger finds a mess...with things strewn all around and blames the dog - who is nowhere to be seen. Mark and Trish go back to the cabin but just before they get there, Roger wakes up from his nap and is killed in the garage...his neck slashed open by a tentacle. Aside from Tiger's odd behavior, nothing seems suspicious. Mark and Trish spend the evening in the sack while Jessica stayed behind at the bar...winning handily against the men at the pool table. When Mark reports to work and meets up with Dan and Brian, they find that the mine appears to have been vandalized. The word DEATH is scrawled above the entrance and several wooden crosses are propped up in front. Unbeknownst to them, it is the work of old man Greenwalt - who is determined to keep the place closed and who also steals several sticks of TNT. Trish sets out for the Silver City Gazette so she can get information about the mine's tragic history - and to buy some groceries. At the newspaper, with the help of Victoria Tusker (Peg Stewart), she discovers that a single miner had survived the mine disaster but the man went insane shortly after. Something unusual had occurred...a conclusion that Mark is reaching on his own when back at the mine, he observes that the skeletal remains were left piled on top of each other. It is not the ordinary way you would find the bodies of trapped workers who had starved to death. Jessica has come across the pick-up in the garage that Roger was supposed to drive to Denver and tells Trish...who then relays that fact to Mark. Perhaps Roger had an accident...but where is he and why didn't he take the truck? The answers to these questions will allude Jessica, who is killed (along with Tiger) after she gets out of the shower when a creature enters the house through a grate. Roger's body is found in the mine, floating in a cavern's waters with his face mutilated. Greenwalt is there as well, ready to blow the whole place up...but not before giving the time-honored "you couldn't let well enough alone, could ya?...you had to open 'em up!" speech. It turns out he is the son of the sole 1912 survivor and explains that there are tunnels underneath the entire town that go into all the homes! The creatures he calls "boogens" were unleashed when the mine was re-opened. Mark, realizing the girls are in danger, immediately phones the Deputy. Dan is dragged off by one of the creatures and Greenwalt attempts to stop the onslaught by setting off some dynamite. It's too late. Bye, bye Greenwalt. Trish finds a trail of blood leading to the basement where she stumbles upon Jessica's corpse. She is pounced on by a boogen but is saved by Mark and the Deputy. Unfortunately, the officer loses his life in grisly fashion. A fuel leak ignites a fire and Mark and Trish escape just before the house blows up. They make their way through a tunnel into the mine where they watch helplessly as Brian becomes yet another fatality. Running for their lives, the two exit out of the mine and Mark tosses a stick of dynamite at the entrance...sealing it permanently. 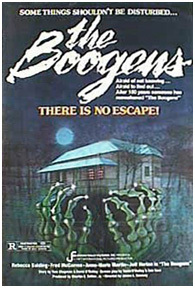 No less than Stephen King called The Boogens "a wildly energetic monster movie." Yet for what is essentially a creature feature, the film has many slasher conventions, including POV, grisly murders and the usual sexual obsessions of some of the characters. The Boogens has its flaws. Does it make any sense that there are tunnels in the mine that lead to all the houses in town? Why would simply blasting the entrance keep the creatures from doing any further harm? Who cares? As with many of these films, suspension of disbelief is in order and can be overlooked due to the direction of James L. Conway, an enthusiastic cast and the terrific use of locations (actually filmed in Park City, Utah). Conway had previously directed 1976's In Search of Noah's Ark, and is the husband of star Rebecca Balding. He's worked steadily in television over the years, most notably as producer and director for Charmed...which also happened to supply his wife with a role. Perennially perky and adorable, Balding was perhaps best known for her turn as Carol (wife of groundbreaking gay character Jodie) in TV's SOAP, but she too was no stranger to the genre...having starred in the excellent Silent Scream (1980) alongside Barbara Steele. Balding's many TV credits include appearances in episodes of The Bionic Woman, Starsky & Hutch, Lou Grant and the short-lived Makin' It. If Anne-Marie Martin, who plays Jessica, looks familiar to horror audiences...it is because she co-starred in 1980's Prom Night under the professional name Eddie Benton. She was later married to writer/director Michael Crichton for 15 years and was left a very wealthy woman after their divorce in 2002. Along with several others involved with the making of The Boogens, Jeff Harlan continues to work in television. Sadly, Fred McCarren passed away on July 2, 2006 of colon cancer at the age of 55, leaving behind his wife Lisa and six children.